Abdullah Azzam Brigades promises to target Iran, Hezbollah and Israel, less than a fortnight after the death of its leader. A Lebanese group loyal to Al Qaeda vowed Tuesday to keep up its attacks against Iran, Hezbollah and Israel, less than a fortnight after the death of its leader, Majid al-Majid. The Saudi-born Majid, whose group claimed responsibility for a November attack on the Iranian embassy in Beirut, died in the custody of Lebanese authorities, who said he was ill before his arrest. "His project will continue, God willing, in striking Iran, its party (Lebanese Shia terrorist group Hezbollah) and the aggressor Jews (Israel), and in defending oppressed Sunnis everywhere," the Abdullah Azzam Brigades said in an online statement. The group also lashed out against Lebanon for "arbitrarily detaining" Islamists, and said Lebanese military intelligence was under the control of "Iran's party," another reference to Hezbollah, which is closely allied with Shia Iran. Hezbollah's military strength in Lebanon is widely believed to be greater than the Lebanese national army, and Sunni politicians have regularly condemned the Hezbollah's considerable influence and the "state within a state" it has formed in some areas of the country, accusing the group of serving a foreign agenda. The Abdullah Azzam Brigade's statement further criticized "attacks against Sunnis orchestrated by Iran's party, which controls Lebanon's military intelligence and manipulates it at will", adding that Iran "manipulates all Lebanese state institutions to protect both its interests and those of its Baathist ally in Syria," a reference to President Bashar al-Assad's regime. According to a judicial source. Majid died from poor health on January 4, days after he was arrested. His body was later sent back to his native Saudi Arabia, after the Saudi embassy had expressed relief over his arrest. The brigades' statement said Majid was detained while he was "unconscious" and in intensive care. In 2009, Lebanon handed Majid a life sentence in absentia after convicting him of membership of another Al Qaeda-inspired group, Fatah al-Islam. "The medical devices that were allowing (Majid) to breathe were pulled out, and God had mercy on him and received him as a martyr," it charged. The statement was issued to express condolences over the death of Majid, whom it termed the "prince of the Levant (Greater Syria), who has gone to meet his God," and whose passing "has filled (our) hearts with sadness." The Abdullah Azzam Brigades was responsible for the deadly attack on the Iranian embassy in Hezbollah's south Beirut stronghold in November, which killed 25 people. Majid had "directly supervised the preparation of" the twin suicide bombing, the statement said. The attack came as tensions rose in Lebanon over the role of Hezbollah in the conflict in neighboring Syria. Hezbollah publicly confirmed last April that its fighters were supporting Assad's regime against the Sunni-dominated rebels, who are backed by most Lebanese Sunnis. Brigades member Sirajeddin Zreikat had already threatened more attacks in Lebanon until Hezbollah ends its intervention. The Iranian embassy attack was only one of a string of bombings targeting Hezbollah. 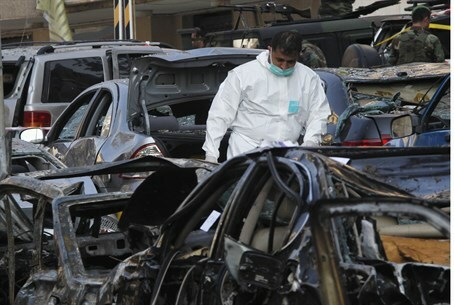 On August 15, 20 people were killed in a blast in southern Beirut. A month earlier, a car bomb in the same area injured about 50 people. Hezbollah has also been blamed for sectarian violence in Lebanon, though it has been more low-key in claiming responsibility. In late December, a prominent anti-Hezbollah MP was assassinated in a blast which killed four other people. That attack was blamed on Hezbollah, although the group denied responsibility.